In 2001 Premier Bartleet Ltd was formed following the merger of the long established companies of Premier Confectionery Equipment Ltd and Norman Bartleet Ltd. In 2014 Premier Bartleet Ltd. updated their company logo, image and shortened their name to Prembar Ltd. A further change to Prembar International Ltd. came in 2018 with change in ownership, due to the fore-planned retirement of the Prembar Ltd owner and Managing Director, and in this modern guise we continue to represent MFG Tray very successfully achieving Plastic Starch Tray sales with multi-national companies operating worldwide including Mondelez, Nestle, Katjes Fassin, Haribo and Mederer to name but a few. Prembar have supplied MFG trays widely throughout Europe as well as to customer sites worldwide in countries such as South Africa, China and Turkey. Molded Fiber Glass Tray, MFG Tray (USA), is a leading manufacturer of high strength, glass reinforced composite containers, trays, boxes, flats and totes for material handling in the confectionery, food service, plastics and electronics assembly industries, as well as in pharmaceutical processing and metalworking. The company continually develops customised solutions for specific material handling challenges and applications. This is a brief introduction to Prembar International Ltd.
MFG Tray extensive experience in the replacement of wooden starch trays with plastic composite. Many of their major clients, at some of the largest jelly and gum production sites in Europe have changed completely over to plastic composite from wood, mixing both wood and plastic trays together with great success during the change-over period. MFG Tray Composite Plastic Starch Trays are widely in use on NID, Makat, and Winkler & Dunnerbier mogul lines all over the world. Through their long experience, MFG Tray have, probably, the widest range of standard tray moulds available for plastic starch trays in the industry, resulting in quick despatch times and considerable cost savings on tray mould cavity costs. This page shows a video of a major state of the art confectionery plant using MFG Composite Plastic Starch Trays and also a General introduction video to MFG Tray, USA. 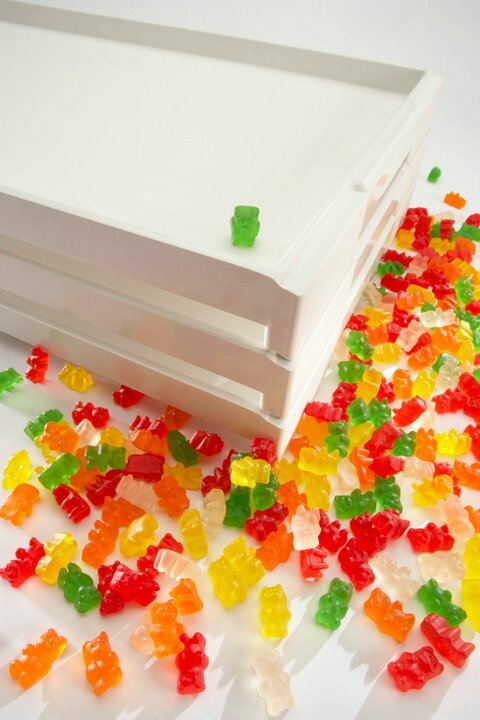 During the depositing and drying of gummy candies in a starch mogul system, the shapely products need to be moved along the line. 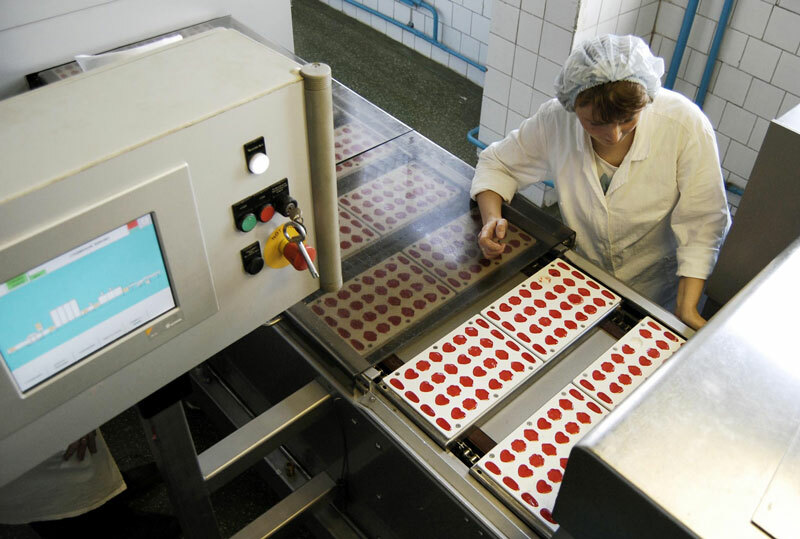 Confectionery manufacturer, Gumi Gida, of Istanbul, Turkey, chose MFG Tray, of Linesville, PA, to provide a complete line of starch trays for handling its products. Gumi Gida produces quality gummy items for international markets. These march from the factory in shapes ranging from fish, hearts, cakes and berries to cola bottles, worms, alligators and tarantulas. They include licensed products such as SpongeBob, Barbie and Bakugan jelly gum with fruit juice, and Yummy Gummy bowls. According to Gumi Gida’s website, the firm stresses quality advancement in safety, materials, technology and research and development. The video below depicts each employee’s attention to food safety when entering the factory to careful use of starch in the moulding process through the final packaging lines. As the camera approaches the mogul, the starch trays can be seen in vertical stacks. MFG Tray’s fiber-reinforced composite starch trays are designed to integrate with regular- and jumbo-sized moguls; they can be used continuously in temperatures ranging from – 15 to 121 deg Celcius, and feature exceptional stacking ability and will not sag or warp under heavy loads. Contoured corners will not trap moisture or starch residue, and radial edges and recessed ends facilitate handling.